The Russian Mars probe Phobos-Grunt has been stranded in Earth orbit for more then a month now. Three weeks ago, on November 29, I obtained the first images of the probe in its parking orbit from my observing location in the south of the Netherlands while the probe was passing over Belgium. It was a 56 degrees elevation pass through the southern sky. After careful analysis and selection of frames from the session, some interesting improved results came out. The image below is one of the best results I have had so far. 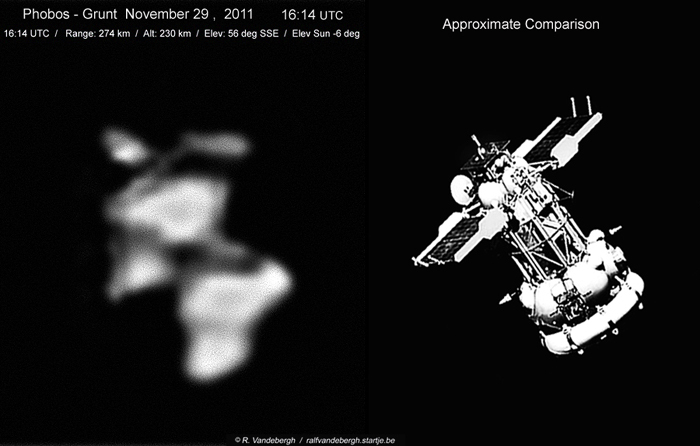 The reference image on the right side shows an approximate comparison, even if the attitude of the probe and the position of the solar panels is a little different compared to the image. Yet, it is relatively easy to locate the similarities. The resolution of the image, obtained through an unstable atmosphere, seems sufficient to confirm the interpretation of the visible elements and the orientation of the spacecraft. All images seems to suggest that the lander is located on top and the propulsion module on the bottom. The best frames show clearly the support structure between both elements, as well as the solar panels. Nice Ralf! It looks as if its solar panels are not fully deployed.